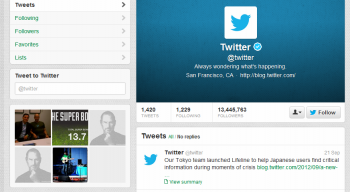 On September 18, Twitter announced an addition to its profiles for both consumers and brands. The header photo complements background images and avatars to let people show their personalities with Twitter profiles. Many brands using the platform for social media marketing moved quickly to integrate header photos into their campaigns. The capability has been live for about one month, and Brafton has seen some interesting images included to increase visibility and improve brand perception on Twitter. Below are 10 noteworthy examples of companies working header photos into their social strategies. BH Cosmetics focuses on creativity. The company’s header photo uses an expansive range of colors and brushes to inspire fans and followers. Capturing brand identity with Twitter backgrounds and header photos shows prospects what a company is all about. One of the premier vendors of international soccer merchandise, apparel and equipment, WorldSoccerShop.com has leveraged Twitter’s header photo to highlight specific players and matches. Focusing on timely event with its design encourages fans to make purchases to prepare for upcoming games and shows the company keeps up with the latest soccer news. A leader in business service management software, BMC Software’s social marketing presence must convey a positive message to its users. In technology, its innovation and reliability attract fans and followers. The futuristic design and color scheme makes BMC’s Twitter presence engaging, and it’s indicative of a company businesses can depend on. A long time leader in social marketing and branding, Burberry’s use of Twitter’s new header photo feature captures the brand’s essence. The simple but sharp look tells fans and followers Burberry is an authority on style. In the past, Brafton has highlighted Coca-Cola’s use of different social networks for its dynamic and engaging campaigns. Storytelling is almost always at the forefront of these strategies, and the company’s new Twitter page is no different. Images of people enjoying Coca-Cola in different settings show fans and followers Coke is truly a soft drink for all seasons. A colorful profile that sparks users’ imaginations and inspires creativity suits Etsy perfectly. The company empowers people to create and sell items they want to share with the world. From the playful background design to the festive header photos, Etsy’s Twitter presence encompasses the brand. The Ford Motor Company strives to build customer pride. They don’t just want people to buy a Ford, they want people to want to buy a Ford. A simple background pairs well with the steering wheel header photo to let fans and followers know they are in charge. General Electric is about innovation. Constantly developing new ways to power the world, GE’s Twitter presence focuses on the inner workings of its plants. Meanwhile, the social content it shares encourage users to be creative and dynamic as well. General Motors captures the rough-and-tumble American worker with its Twitter page. Its header photo and background both show off a heavy-duty pick up truck, along with the company’s partnership with the National Football League. What’s more American than that? Starbucks’ header photo and background image illustrate that customers can enjoy coffee created with a commitment to quality. The message is brilliantly expressed through fresh coffee beans and two people enjoying mugs of coffee.